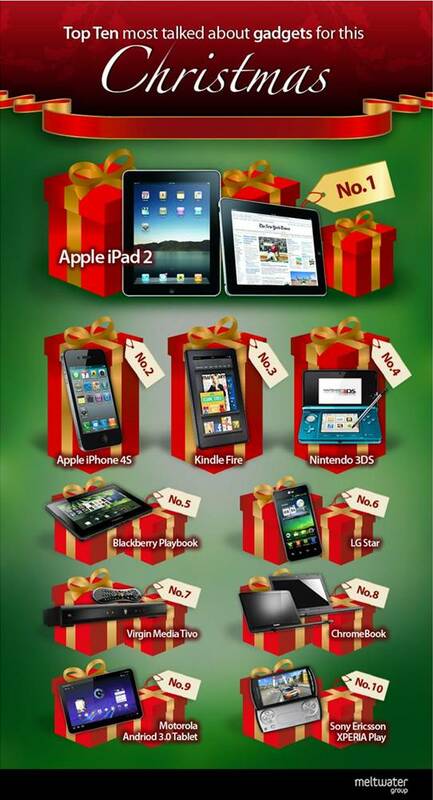 The top 10 most talked-about gadgets this Christmas? BlackBerry PlayBook is in there. Is it really less than two weeks to Christmas? It’s that time of year when we fill stockings with apples & oranges, and present toy train-sets and the latest hit doo-wop LPs to our nearest and dearest. Wait a minute…what year is this? Damn. Let’s start again. With the digital revolution in full-swing, most ‘Dear Santa’ letters will have at least one new-fangled gadget on it. With that in mind, Meltwater Buzz, the social media monitoring platform, has been tracking what gadgets have been most discussed online in the lead up to Christmas. To generate this analysis, Meltwater Buzz was used to examine the volume of online conversation across all social channels around some of the most talked about gadgets of 2011. The initial list was gathered from recommendations in top-tier gadget magazines and from the tech press. Using search terms that included mentions of product names alongside festive words such as ‘Christmas’ and ‘Xmas’, global conversations were monitored across 200 million sources including Facebook, Twitter, blogs and other online channels. The data was extracted and examined to establish which gadgets had generated the highest volume of online mentions. It probably won’t surprise you to learn that Apple products took the top two spots. But there are a few surprises in there, with the BlackBerry PlayBook coming in at number 5 – could it be that people were saying “please don’t get me a BlackBerry PlayBook this Christmas?”. And the UK-only Virgin Media Tivo set-top box is at number 7.